The banister is the top part of the hand rail system that can usually be gripped by individuals walking up and down the stairway. 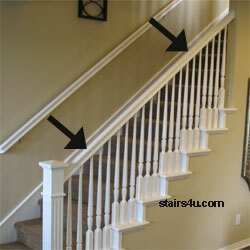 Bannister's come in different shapes and sizes and can usually be found at your local stair supply warehouse. Some stairway handrail parts like these are going to be difficult to find at your local home improvement centers or lumberyards. Most building material suppliers have access to handrail parts, but you will probably be stuck ordering from catalogs. I can't think of one type of wood that these products aren't made from. I'm not about to suggest that you'll find a spindle carved from zebra wood, but I wouldn't be surprised either. Most stair handrail banisters materials can be used for gripable handrailing also.